It had been way too long since my wine loving buddies, Gerry B. and John G., and myself got together for one of our wine dinners. 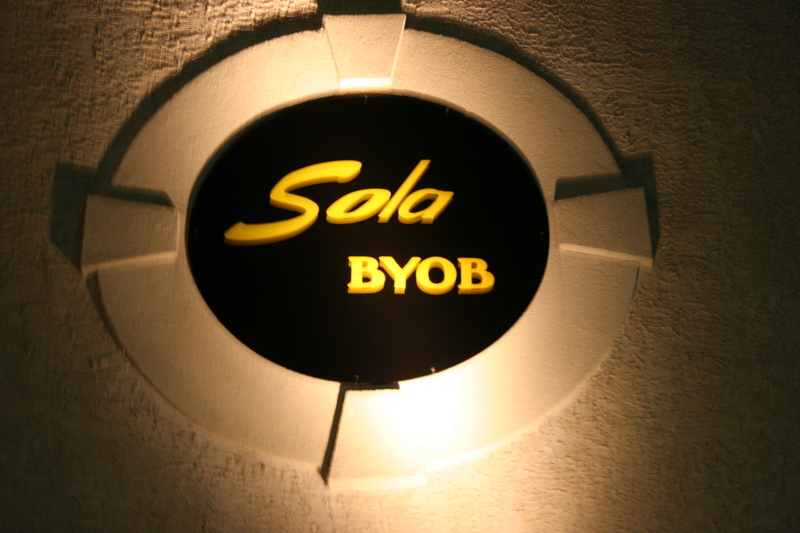 Last night we met up for a six P.M. reservation at Sola on Lancaster Ave. in Bryn Mawr, PA. The parking was a little tricky but once we found some spots we were at a table in the fashionable, upscale dining spot. Some nice piano music, just a decibel or two louder than it should have been, provided a nice backdrop for our meal. 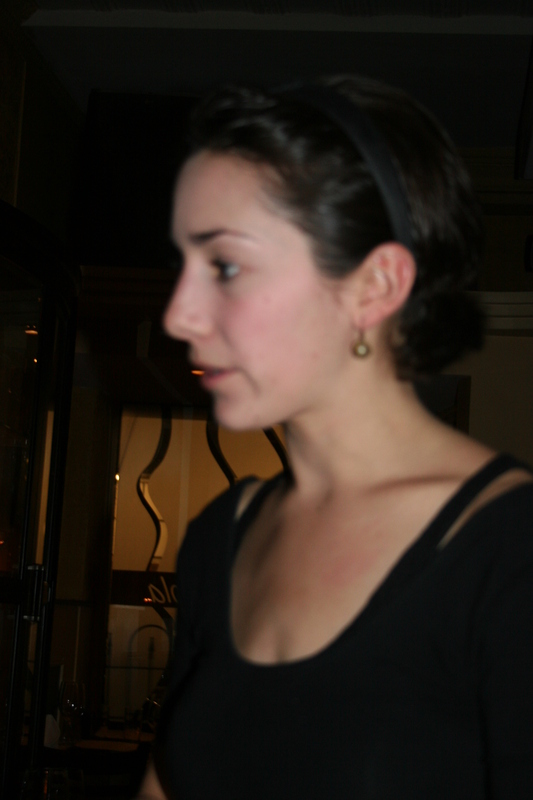 Our server, Marina, was both personable and efficient. She opened our wines. There were no specials to recite so she told us a few of her favorites. 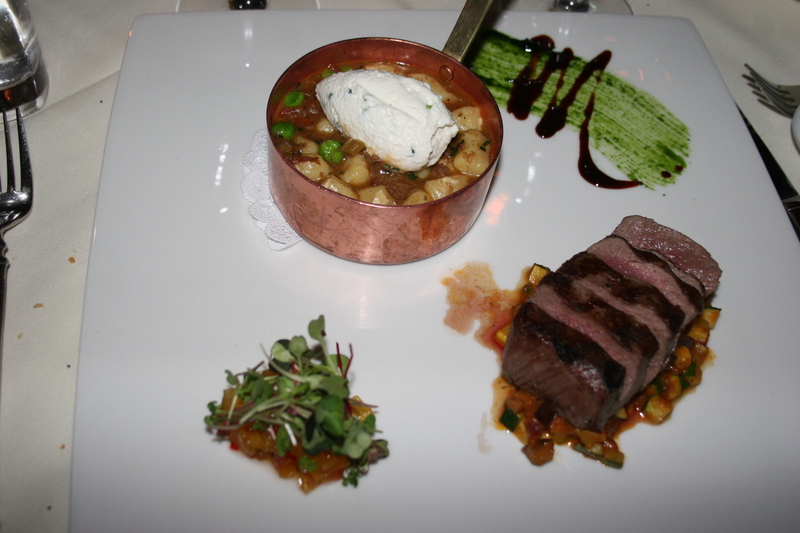 Sola offers a tempting Prix Fixe Dinner at $40.00 which features a salad, appetizer, entree and dessert. The regular menu has more than a few items that caught our interest and it was apparent from the start that choosing just one was not going to be an easy task. As usual, we had a wonderful array of good wines with us. Sola charges a minimal $2.00 corkage charge, which, I believe, is donated to a charity. In return they offer excellent stemware and we had separate glasses for each of our four wines. 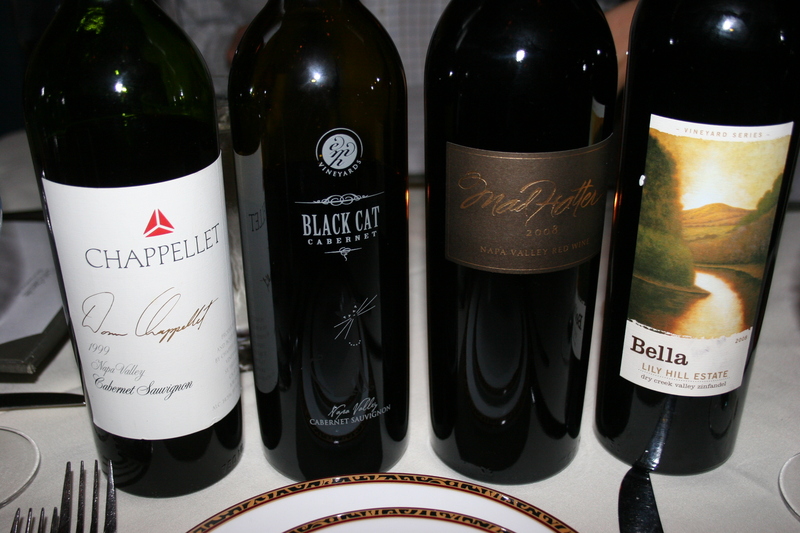 It was hard to pick a wine of the night from this group which included, a 2005 EMH/Black Cat Cabernet Sauvignon, perhaps the sole survivor of several Black Cat cabs we purchased while visiting Merrill Lindquist during our October Napa trip. This one was dark ruby in the glass and drinking only slightly less well than the fabulous 2007. We also had another souvenir from our trip, a 2008 Bella Vineyards, Lily Hill, Dry Creek Valley, Zinfandel, chock full of pepper and spice and plenty of dark cherries and plums. Gerry B. had also bought his last 1999 Chappallet Vineyards, Cabernet Sauvignon, which we had all raved about on a prior wine dinner. It was still great but not performing quite as well as we had remembered. Our final wine was one that none of us was familiar with but one which certainly held its own even in this group. It was a 2008 Mad Hatter, Napa Valley Red Wine. It’s tough to find much info on this wine although it appears to be made by the folks at Dancing Hares wines (where Andy Erikson, winemaker for Screaming Eagle, presides and may be responsible for the Mad Hatter) and sells for about $55.00 which is well above its current $29.99 price at PA State Stores. 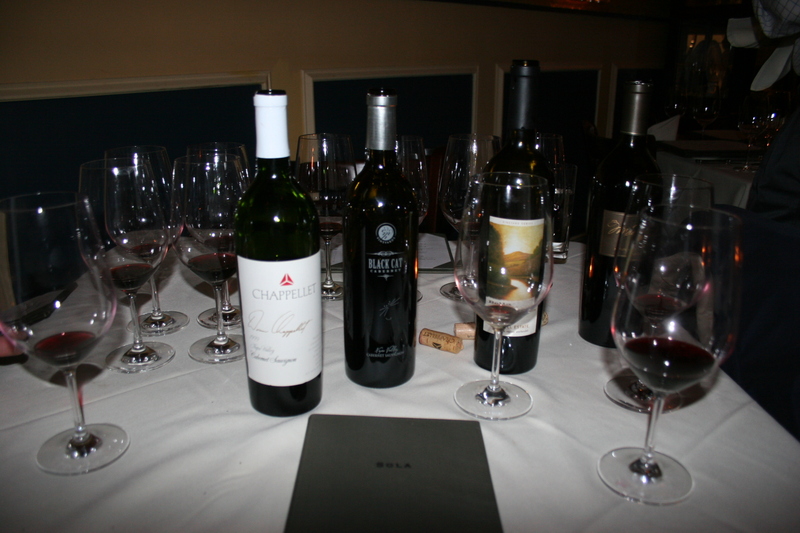 The wines were great and I am happy to report, so was the food served at Sola. 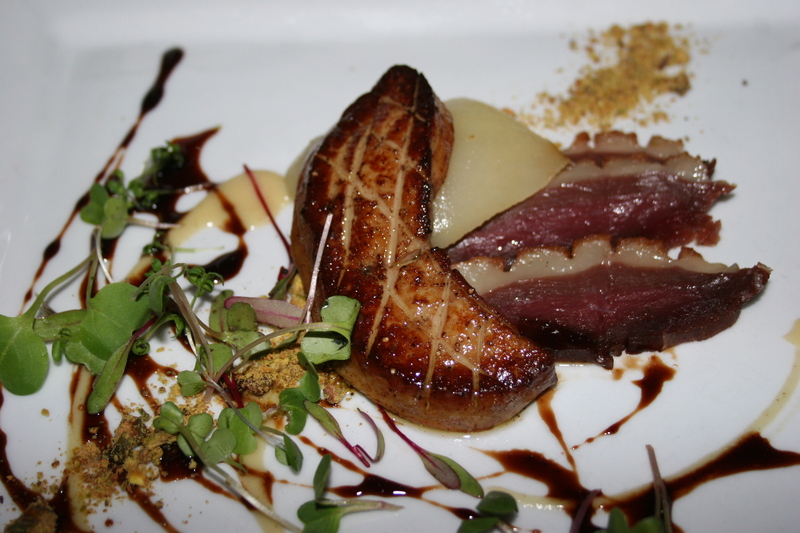 Gerry and John each had the Pan Seared Fois Gras, house cured duck prosciutto, poached Seckel Pear, toasted pistachio and port reduction. Gerry thought it tasted great while not quite being as stellar as Gilmores. 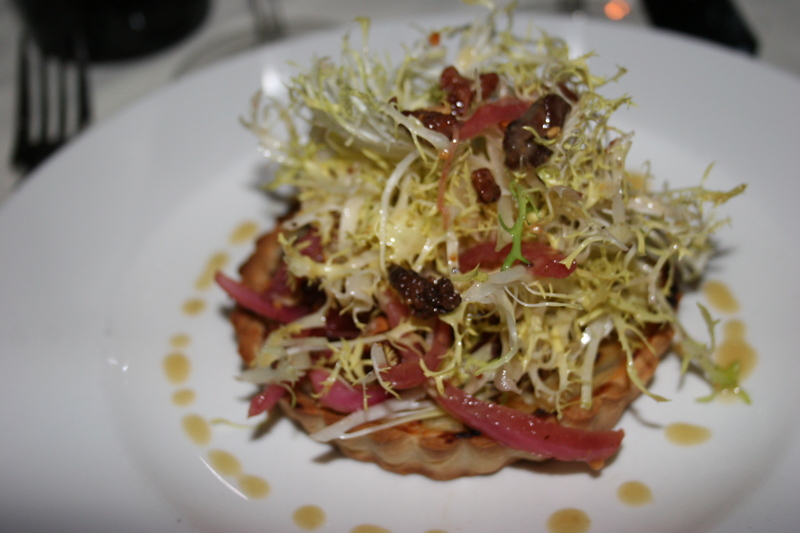 I wanted to try the Lobster and Pumpkin Bisque but made a last-minute switch to the Carmelized Onion and Gruyere Tart, baby frissee, pancetta lardons, aged Jerz-hazelnut vinnegrette. This was an unusual item that had a unique flavor. I had sworn off all food items containing the word “frissee” but I totally enjoyed the taste of this appetizer. Ya just never know. 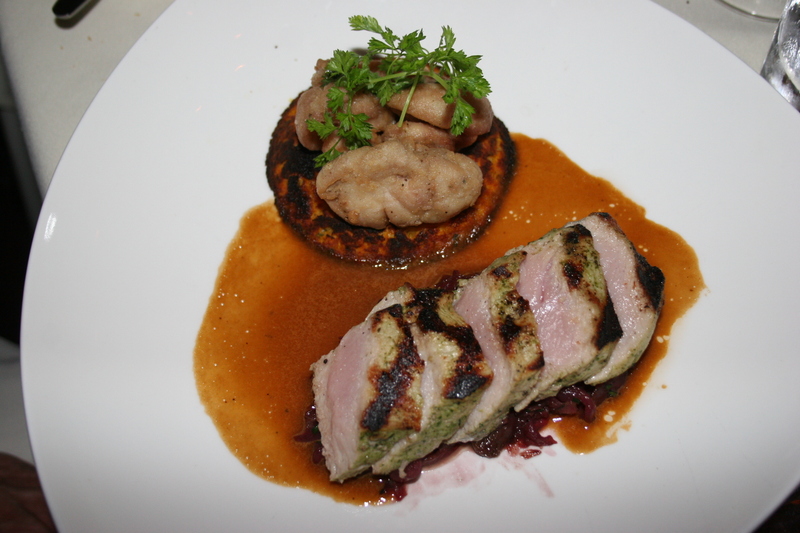 For his entree, John G. selected the Herb Marinated Veal Tenderloin, kabocha squash tart (does one EVER tire of kabocha squash tarts? ), crispy sweetbreads, truffle oil, red wine braised purple cabbage and sherry jus. The veal was done to medium perfection and John thought the dish was excellent. Gerry ordered the Australian Lamb Two Ways, braised shoulder, hand-made gnocchi with English peas, ricotta grilled loin, ratatouille and mango chutney. Gerry loved this dish and insisted I try the stew like portion and although I am not a big lamb fan, this really was outstanding. I certainly had no complaints about my entree. I chose the Seared Diver Sea Scallops, carmelized salsify golden raisins, Meyer lemon and Israeli cous cous, with a smoked tomato butter, pine nuts and shaved botarga. 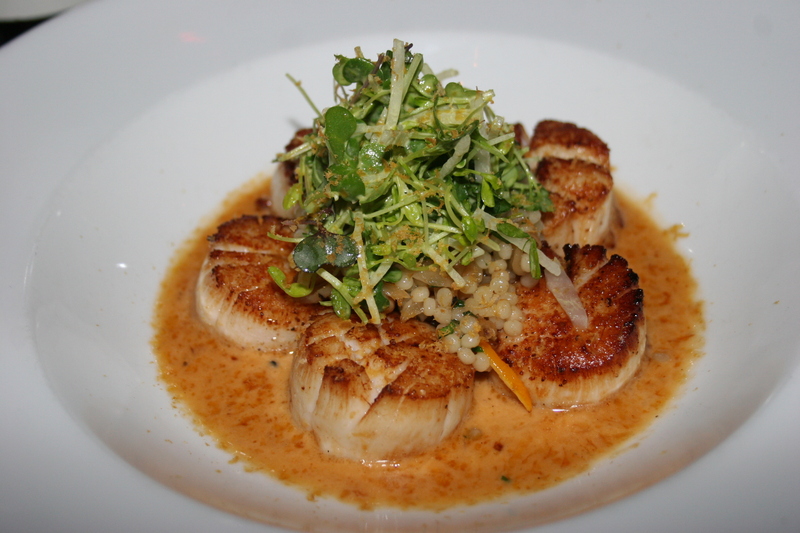 The presentation was picture perfect and the scallops with the sauce created a mouth-watering taste sensation. The entree was light and full of flavor. If I had any regret at all it was that I did not have a Pinot Noir to drink with the scallops. The three of us were enjoying great conversation and sampling the quartet of excellent wines so it only made sense to extend the meal by ordering from the dessert menu. 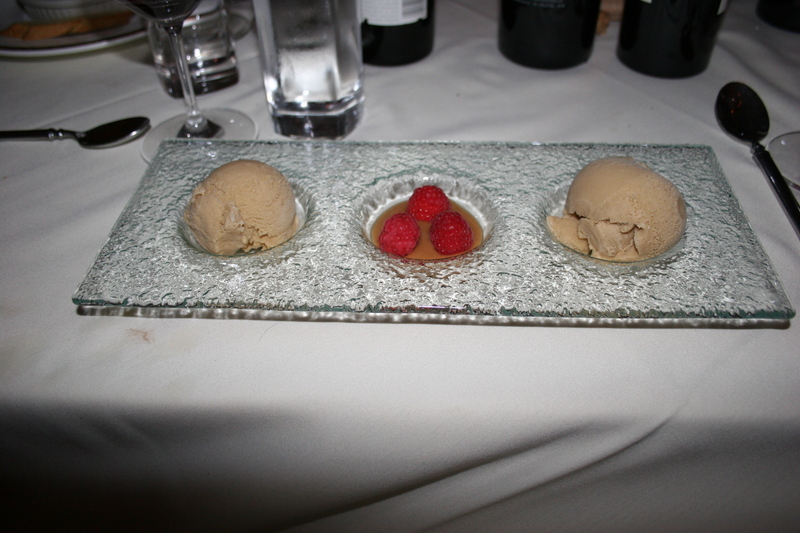 The trio of goodies above are from left to right, my Espresso-Brown Sugar Gelato. Like Gerry mentioned, “what’s not to like about Espresso and brown sugar”. This was light and yummy. 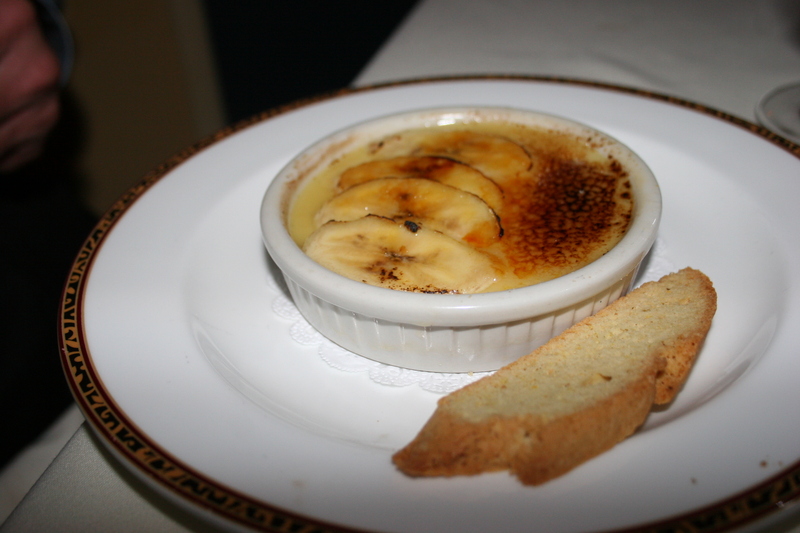 John was no less pleased with his Roasted Banana Creme Brulee with orange-ginger biscotti. Gerry may have made the best choice as he went with the dessert offered on the Prix Fixe menu and the one that Marina declared her “absolute favorite”, the White Chocolate, Golden Raisin & Coconut Bread Pudding with caramel sauce and macerated strawberries. This one was just a plate-full of gooey goodness. With our tummies full and the wines nearly gone it was time to end this wonderful dinner. Sola is a bit on the pricey side but it certainly delivers value for the money. As I headed home and Gerry and John finished their post-dinner cigar it was evident that a return to Sola would definitely be in our future plans.